Home » Uncategorized » No Prey, No Pay (on a Friday Night)! No Prey, No Pay (on a Friday Night)! It’s not only children that Captain Burwash regales with his tales of privateers and plain old pirates. 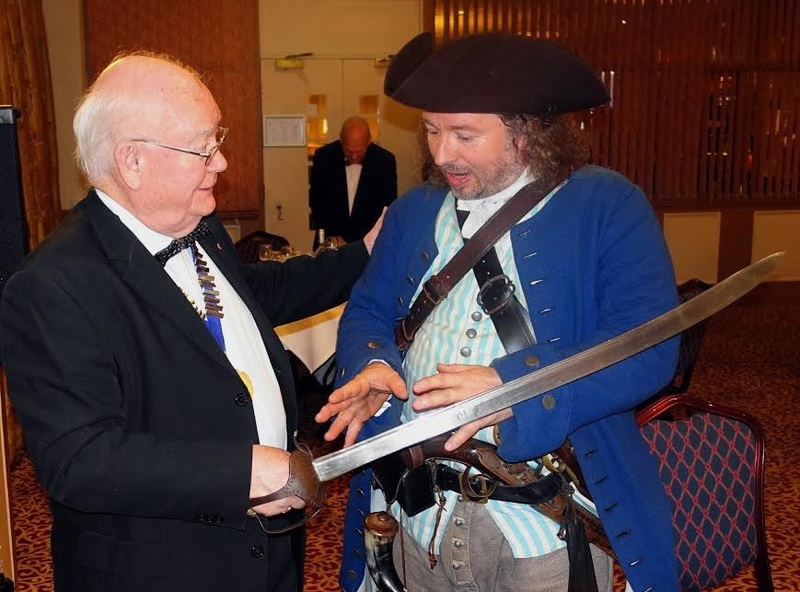 Yesterday evening, after the Calder Probus Club members had finished their hearty repast, he spoke to them of how chasers chased the chase, and told of the deeds of Blackbeard, Morgan, Calico Jack, Anne Bonny and Mary Read (amongst others). As his audience were a tad older than his regular listeners, he added in some of the more unsavoury parts of the stories – let’s just say that pirates can be even ‘naughtier’ than he tells children! The listeners asked him about pieces of eight, jolly rogers and muskets, and all sorts of other things, which luckily he just so happened to have with him. After his talk, he took the opportunity to chat to some of the individuals there. Here he is explaining how the lock of his stolen French Fusil works. And here he is wondering whether he should have so readily disarmed himself! 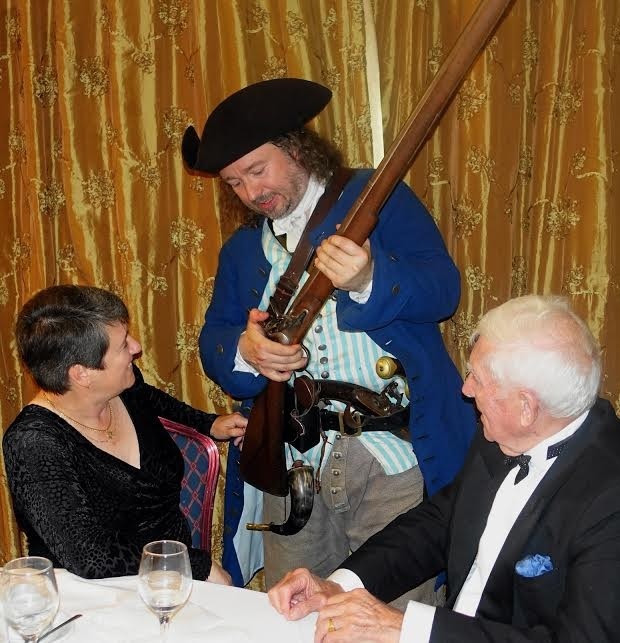 The evening was a success, although the captain was worried that the ladies amongst the audience might suffer from nightmares that night as a consequence of his plainspoken account of his fellow sea rovers! If you want to know more about Captain Burwash, please click here. And if you want him to visit your school, do please get in touch. Our topic ‘Land Ahoy’ was completed by an outstanding day delivered by Captain Burwash!! The day was fun and packed with inspirational activities. The children enjoyed creating a Jolly Rogers for Captain Burwash’s ship and writing an advert for a vacancy for ruthless crew! There were lots of opportunities to handle some of the artefacts. The children were in awe of the many stories told about Blackbeard and other pirates. It was an excellent day which left the children buzzing! !